UPDATE: According to Kentucky State Police, security footage shows that Shawn Christy is the person who broke into Dakota Meyer’s house sometime today. Around 6:23 p.m. Meyer’s brother, Timothy Gilliam, arrived home to find the front door kicked in. Local police and Kentucky State Police were called and cleared the home. They discovered that someone had stolen food from a refrigerator and taken a 2001 Jeep Grand Cherokee with a black hood from a detached garage. Gilliam showed troopers surveillance videos and it appears that the suspect is Shawn Christy who recently has made threats to President Trump and Dakota Meyer. The U.S. Marshal Service continues to lead the manhunt investigation. The burglary and stolen vehicle investigations are being led by Trooper Chase Willis. UPDATE: The stolen vehicle is a 2001 Jeep Cherokee, license number 095WYT. It is a mail carrier vehicle with right hand driving. If you see this vehicle, do not approach it. Call 911. 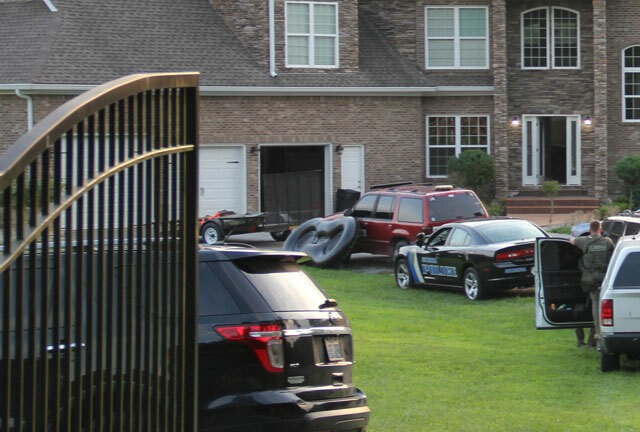 The home of Dakota Meyer was broken into sometime today and a vehicle was stolen from the property. Local, state and federal law enforcement agents are currently on the scene. Meyer, a Medal of Honor recipient, has been in the sights of a fugitive who was believed to be in the area earlier this week. Federal agents have been searching for Shawn Richard Christy, 27, of Pennsylvania. They believe Christy stole a vehicle that was found Saturday night not far from Meyer’s residence near the Adair/Green county line. Christy has threatened to kill President Trump and others, and also said he would kill any law enforcement that got in his way.